1) go ballistic: lean on the horn, yell and scream, thinking about waste of your time, cost of delay, etc. The second response in each case demonstrates use of smart brain power – Executive Functioning. The first step is awareness of response options we have, next making the smart decision, and finally following through with smart action. Advances in the neurosciences have led to important discoveries about the structure and function of the brain, and how we learn and remember, how evolutionary developments designed for survival can work for or against us in our modern-day lives. Our brain power can thus be smart or dumb, depending on how we use it. With commitment, training and practice, we can learn to manage the attitudes, emotions, and actions that determine the paths of our lives. We now know that the prefrontal cortex that is responsible for the heavy lifting in terms of Executive Functions (planning, organizing, goal-setting, decision-making, problem-solving, and working memory) is the most recently evolved part of the human brain, and that it is the last to develop in individuals. Current estimates are that the highest levels of these functions are not fully developed in the average individual until the mid-to late twenties. In individuals with developmental delays, like ADHD, the delays could be as much as 30%. 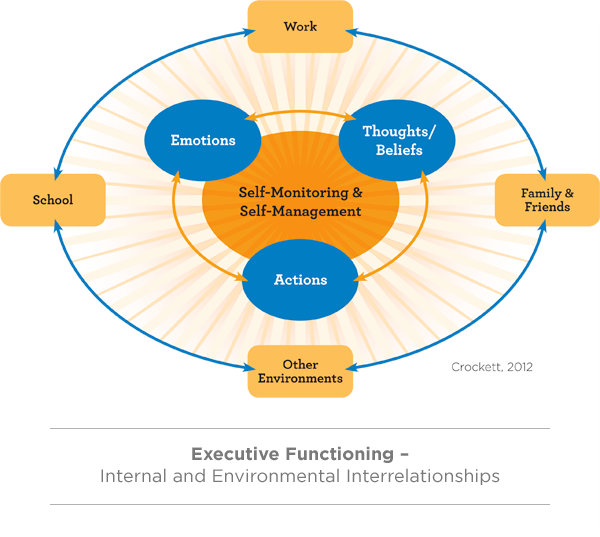 The good news, however, are findings that the trajectory of development of Executive Functions can be dramatically accelerated with skilled support – coaching, teaching, mentoring, etc. The plasticity of the brain continues to amaze scientists, and there is no question about the combined influences of genetics and life experiences. As with so many skills, the sooner Executive Functioning skills are learned and practiced the better. Even middle schoolers can begin learning these skills and build on them in high school and later in college and the workplace. As illustrated in the flow chart above, benefits apply to all areas of our lives.